The twin-reactor Vogtle nuclear plant under construction in Georgia is a frequent topic here on SLB (see articles here, here, here, here, and here ) Over the years, the plant's cost to construct (final cost estimate) has progressed from $14 billion to $17 then $21 billion. Today's news article from Reuters (see link) has the latest estimate at $29 billion - and the plant is still far from completion. 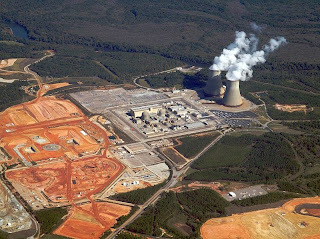 The Reuters article from 6/15/2017, "Group says Georgia nuclear plant costs rise to $29 billion," references a watchdog group Southern Alliance for Clean Energy. That's for 2200 MW output; the $29 billion is more than double the initial estimate of $14 billion. Note the pattern the nuclear industry uses over and over: lowball the initial estimate to obtain approval to build. Blame the contractor, designer, suppliers, and regulators for cost overruns. Beg the PUC for money to finish the plant. Charge the customers for all the costs. The Vogtle plant uses the infamous Westinghouse design known as the AP-1000, a pressurized-water reactor design that is supposedly cheaper, safer, and much faster to build than previous designs. Westinghouse, as is well-known, recently filed for bankruptcy due to huge losses in the nuclear plant business. This design was one of the ones certified by the US NRC that is "off-the-shelf," that is, NOT a unique design that requires lengthy study to obtain NRC certification. There are four such AP-1000 reactors under construction in the US, two at Vogtle as already stated, and two more at the Summer plant in South Carolina. A few others with slight modifications were built, or are under construction in China. Nuclear cheerleaders are quite fond of stating that modern nuclear plants are built for $4000 per kW of electrical output. The present estimate of $29 billion and 2200 MW yields a cost per kW of $13,180. It is also notable that the AP-1000 is supposed to be built in modules, so that multiple areas can be built on simultaneously. Then, the finished modules are simply fitted into place. That construction technique actually was used in the construction of Liberty Ships in World War 2, and it did shorten the construction time for the ships. It obviously is not working for the nuclear plants. The sad saga of the Vogtle nuclear plant continues. With three years remaining before startup, there is plenty of time for more problems to occur, more delays, more costs, and even then who knows if the plant will be certified as safe to start up and operate.